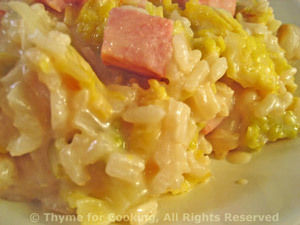 Risotto with Ham and Savoy Cabbage, Thyme for Cooking comfort food. The soft goat cheese adds an extra creaminess to this risotto. You could substitute an equal amount of cream cheese - but it's higher in fat and calories (just so you know). Remove dark green outer leaves from cabbage. Cut off a thick slice, avoiding the core. Lay flat, cut into 3 or 4 wedges and roughly chop. Heat oil in medium skillet. Add onion, cabbage and sauté until tender, 6 - 8 minutes. Turn heat to low, cover and keep warm until needed. When stock is almost absorbed add another 1/3 cup and continue adding 1/3 cup at a time and stirring. Before you add the last 1/3 cup taste a few kernels of rice. They should be just 'al dente' - slightly resistant to the tooth but fully cooked. If more stock is needed add it 1 tbs at a time and waiting until almost completely absorbed. At this point risotto will be thick but not stiff - there will still be visible liquid and it will not hold it's shape on a plate. Add the Parmesan and the condimenti, including the goat cheese, stir well, pour into a bowl or risotto platter and serve immediately.